What Is Guaranteed Universal Life Insurance and How Does It Work? It’s commonly recognized that traditional universal life insurance policies are a waste of money, but what is guaranteed universal life insurance, and how does it work? Guaranteed universal life insurance, also commonly known as a “GUL” policy, is something of a “hybrid” between term and whole life insurance. GULs offer the permanence of whole life insurance and the affordability of term life insurance, with level rates and premiums until age 90 or later. These policies do not require an investment value, and their are no investment risks. With a GUL policy, your monthly rates and coverage can be guaranteed until the age of your choice, even to age 121! In this article, we’ve explained how guaranteed universal life insurance differs from other types of coverage, and the benefits that it can offer, to help you determine if it’s the right type of coverage for your needs. 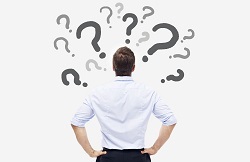 What’s the Difference Between Term and Permanent Coverage? How Does Guaranteed Universal Life Differ? What Are Some Common Uses For Guaranteed Universal Life Insurance? How Do I Apply for Guaranteed Universal Life Insurance? Most life insurance policies can be divided into two categories: term life insurance and permanent life insurance. Term life insurance is extremely popular with our clients because it offers a high death benefit at a relatively low cost. Term insurance is inexpensive compared to other forms of coverage because it is not designed to last your entire life. Instead, it is designed to offer a “safety net” in case you die while people are still financially dependent upon you. Term insurance rarely offers coverage past the age of 80, and most people purchase a term that coincides with their planned retirement age, their mortgage, or until their children move-out and become self-sufficient. A “$500,000, 30-year term” would provide a $500,000 tax-free death benefit to your beneficiary if you were to pass away within the next 30 years. During this 30 years, or the “term” of your policy, the insurance company cannot change your rates or coverage regardless of any changes to your health. Term life insurance can be cancelled at any time with no penalties, and many companies will also allow you to decrease your coverage and monthly cost, or convert a portion of your term policy into permanent coverage. Permanent life insurance is designed to last your entire lifetime and provide a payout to your beneficiary whenever you pass away. Permanent life insurance is generally purchased to pay for final expenses, pass wealth down to heirs as an inheritance, or to help avoid estate taxes. There are four common types of life insurance that offer “permanent” coverage. These are whole life insurance, non-guaranteed universal life insurance, variable life insurance, and guaranteed universal life insurance. Whole life insurance companies typically offer healthy applicants $5,000 to $50,000 of coverage without a medical exam. These companies charge a fixed rate to everyone based on their age and gender. These companies usually ask a few health questions and they electronically review your medical records before approving your coverage. While these policies may be ideal for smokers, or people who need $10,000 of coverage or less, they are not ideal for everyone. We’ve outlined a few of the reasons that we often recommend avoiding traditional whole life insurance below. Whole life insurance is very expensive for healthy people, because purchasers must pay a higher rate to supplement the cost of someone who may have a few health issues. Most whole life companies do not verify if their applicants use tobacco or have a hazardous hobby or occupation, so everyone must pay a higher rate for these assumed risks. Low coverage amounts – traditional whole life insurance is usually limited to a death benefit of $50,000 or less. Having access to a lump sum of cash can prevent your family from struggling to pay for your final expenses, but if you want to leave $25,000 or more behind, guaranteed universal life insurance may be a much better option. For many people, these policies offer a lot more coverage for a fraction of the price. Universal life insurance policies and variable life insurance policies offer to build a small cash value over time. In theory, this cash value can be used to a later time to finance life insurance premiums, or you can withdraw the cash value from your policy. Permanent life insurance policies that offer and investment component carry large money management and annual investments fees that reduce your gains. The cost of your coverage is not guaranteed, and most of these policies have an adjustable COI (cost of insurance) that increases dramatically as you get older. The “cash value” in your policy is never really your money. If you access your money it is viewed as a loan and it must be paid back with interest. If you pass away before the loan is repaid, the amount you owe will be subtracted from the benefits your family receives when you die. Historically, permanent life insurance policies rarely preform well and most become underfunded. When you meet with your agent, it’s important to note that “projected” illustrations your agent is showing state “non-guaranteed”, and the market never performs ideally for decades without hiccup. Most financial advisers recommend keeping your investments and your life insurance separate. Life insurance is a poor investment vehicle due to it’s expensive management fees and if your investment don’t do well, you won’t have to worry about losing your life insurance. In fact, most trust attorneys refuse to use and non-guaranteed insurance policy to fund a trust due to their risks and uncertainties. To prevent leaving an estate tax liability behind for your loved ones, most insurance agents, bankers, financial planners and trust attorneys recommend guaranteed universal life insurance. Guaranteed Universal Life Insurance, commonly known as a “GUL” policy, is something of a hybrid between term and permanent life insurance, and it offers it’s purchasers the ability to take advantage of the best features of both. Rather than guaranteeing rates for a “term” of 10, 15, 20, 25 or 30 years, with a guaranteed universal life policy you can guaranteed your rates and coverage to a specific age. Most GUL policies offer level rates and coverage to age 90, 95, 100, 105, 110, or 121. 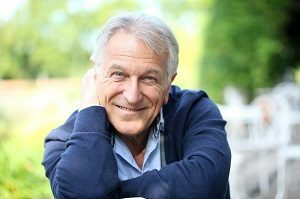 After the age of 65, GUL rates are often comparable with term life insurance, but they offer coverage until later in life. For a few dollar more a month you can lock in a policy that will likely exceed your life span and at much lower premiums than a whole life insurance policy. The chart below compares monthly premiums for a healthy males for Protective Life, a popular A+ rated life insurance company. As with most companies, Protective’s term life insurance is available up until your late 80’s, whereas a “GUL” policy is available to later ages. *Monthly rates are accurate as of 04/06/2018 and are provided for illustrative purposes only. The key word is guaranteed. With a guaranteed universal life insurance policy your rates and coverage cannot change as long as you pay your monthly premiums on time each month. Your rates are guaranteed regardless of any changes to the market, your age, or your health. To obtain an accurate quote based on your unique health profile, please call us toll-free at: 855-902-6494. Our experienced agents will be able to compare rates from dozens of top-rated insurers to find the least expensive options available. As the charge below demonstrates, the biggest savings for guaranteed universal life over term life insurance begins for males at age 75. This illustration shows it’s possible to pay less per month for a policy guaranteed to age 100 than a term life insurance policy with rates guaranteed until age 91. A guaranteed universal life insurance policy has a much higher probability of paying out due to the fact that very few men live to age 100. In fact, the odds of a male living to age 100 in America, as of 2015, is less than 1%. With this in mind, it’s important to purchase a policy that will remain affordable, even when you are living on a fixed income. We did not include the rates for a female in great health, but to get a rough idea of women’s rates, multiply the rates below by approximately 0.7 or 70% of the prices listed below. Females almost always pay less for life insurance due to lifetime expectancy. As of 2015, approximately 2% of American women live to age 100. *Displayed monthly rates are accurate as of 04/06/2018 and are provided for illustrative purposes only. The most common reasons to purchase a guaranteed universal life insurance policy include: leaving an inheritance, providing money to your surviving family to cover the cost of your final expenses, and to protect your estate from estate taxes with an irrevocable life insurance trust. Last year, we worked with Robert G. of Virginia. Robert wanted to purchase permanent life insurance to leave money behind for his two daughters. Robert’s youngest daughter has special medical needs and is permanently disabled. His oldest daughter has agreed to take care of her younger sister when her father Robert is no longer able to. Robert’s wife, Barbara, passed away a few years ago from cancer and she did not have life insurance when she passed away. Her medical bills and burial cost were a large financial set back for the family, so he wants to make sure his daughters are well-taken care off. Robert is 58 and nearing retirement age. He wants to leave his daughters at least $250,000 to help provide for his disabled daughter’s care. Robert is in pretty good health overall. He controls his blood pressure with Lisinopril, and his cholesterol with Crestor. Robert is 5’8” and about 195 pounds. After shopping a few companies, we were able to match Robert with a company that approved his life insurance application as a “Preferred” risk, the number two of twelve “risk” categories. 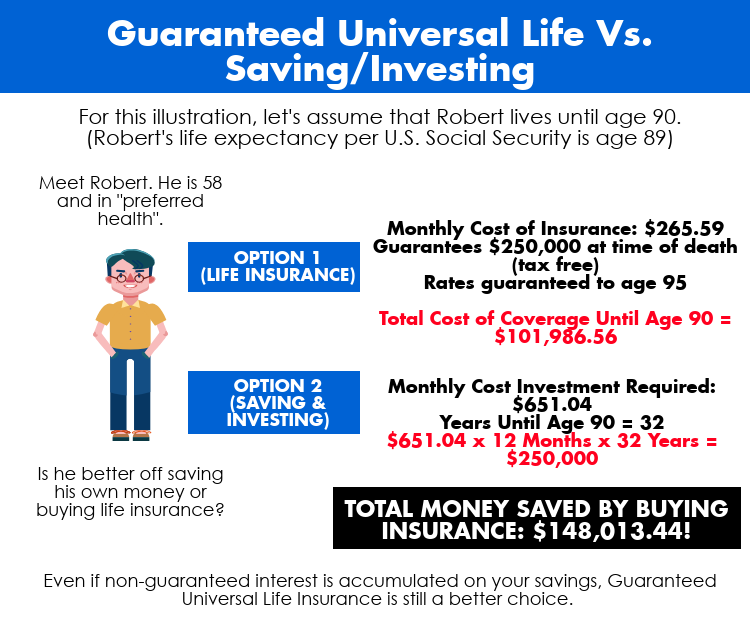 The men in Robert’s family usually live into their 80’s, but to be on the safe side, Robert chose a Guaranteed Universal Life policy with rates locked until age 95. Robert’s $250,000 GUL insurance policy approved at a monthly rate of $265.59. If Robert were to put money into the bank to save up $250,000, he would have to deposit over $600 at today’s low interest rates, until he’s 90 years old. Robert said he could work $265 into his monthly budget, but $600 a month was out of the question, especially when he retires and needs to live on a fixed income. Dr. Williams, a physician from Denver, Colorado, called us for help with his life insurance needs. He is 52-years-old, has a mortgage with about 15 years remaining, and a wife that relies on his income. He wants life insurance to protect his family home for his wife, which he plans to pass down to his adult children someday. His current mortgage balance is just shy of $1,000,000. Once the house is paid off, Dr. Williams’ savings, pension, and investment income will greatly reduce his need for life insurance. Dr. Williams said he would still like to leave his wife with some money to cover any unforeseen medical bills, burial costs, and any other unforeseen expenses that may occur. He felt that $250,000 would be more than sufficient for this purpose. For Dr. Williams, purchasing two separate policies and layering coverage was the best choice. We recommended securing a 15-year term policy for $1,000,000 to protect his mortgage, and a $250,000 “GUL” policy until age 95. If Dr. Williams dies before the house is paid off, within the next 15 years his wife will have a combined $1,250,000 available. She could continue making mortgage payments, or pay off the house entirely, and she won’t need to access money designated for retirement. What’s key to this two-policy approach is future flexibility it offers. If Dr. Williams pays his home off early, or changes his mind and doesn’t need that policy for any reason, he can easily cancel the term policy and end making payments. Banner Life, the A+ insurer we recommended for his 15-year term policy, also allows a one-time policy reduction. This will allow Dr. Williams to reduce his policy, and corresponding premiums, in the future as his mortgage is paid down. By purchasing a policy that is guaranteed to age 95 at his current age, Dr. Williams will be saving a consider amount of money rather than waiting until he is almost 70. He’s also saving a great deal of money by purchasing two policies instead of an extremely expensive permanent policy for $1.25 million for the next 40 years. The process for applying for guaranteed universal life insurance/GUL policy is exactly the same process as applying for a term life insurance policy. To get started, we always recommend working with an independent agency that has access to at least a few dozen top-rated companies. At Term Life Advice, our agents are experts at pre-qualification underwriting which allows us to quote accurate rates upfront. Every life insurance company sets its own rates and guidelines and by having access to more than 60 companies, we’re able to find the best match for our client’s based on their age, health, lifestyle and coverage needs. Once we’ve compared rates and determined your best option, we’ll complete your application right over the phone and schedule your free mini-medical exam. After you complete the free in-home health screening, your work is done, we’ll follow up with the insurance company until your policy is approved. The approval process typically takes 6 to 8 weeks. During this time, your lab results will be processed and sent to the insurance company’s underwriter. After reviewing your lab results, the insurance company’s underwriter will approve your application after requesting additional records from your doctor. Your underwriter will then assign you with a “risk” class the will ultimately determine the cost of your life insurance policy. Once your policy is approved, you’ll have an opportunity to review your policy and accept or decline your policy. You’ll also have an option to adjust your coverage if needed. Remember, no money is due until you review and accept your policy, and with most companies, you have up to 30 days to make a decision. Additionally, most life insurance companies provide a 14 to 30-day “free look” period after starting your coverage. During this time, you can cancel for your coverage for a full refund. After your free-look period has ended, your can cancel your policy for any reason with no further costs or obligations. To see the steps to buying life insurance, please see our illustration, Approval Process for Life Insurance Insurance. Buying life insurance is one of the most important decisions you’ll ever make, and educating yourself and shopping the market are a must! If you need help determining your best options, or if you’d like accurate quotes based on your age and unique health profile, give us a call today at: 855-902-6494. Our services are completely free, and there is not cost to apply for coverage. Give us a call today, or you can request a free online quote below to compare rates from more than 60 life insurance companies in less than a minute.